While the men and women who do comic strips are often “off-the-wall,” they occasionally “nail it” and this is one such case, and it serves as an opening to a profound discussion. 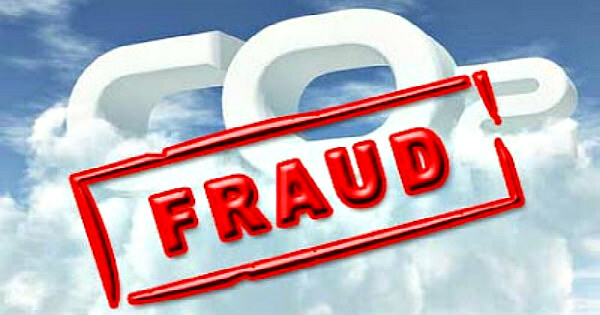 How did the man-caused global warming fraud happen and what supports it? For most of the history of physical science, chemistry and physics, the work was done by two kinds of men, those who inherited wealth and those who were stealing it. In-between there were the few who could afford to do an occasional experiment, make a discovery and prosper as a result. They were few and far between. Corporations and governments have changed that with discoveries that lead to new products and more lethal weapons as well as cross fertilization with capital, some borrowed and some taken as taxes. Meanwhile, the colleges and universities formalized science education and acquired the power to determine who could practice the sciences and who could not. As this evolved so did corruption. We say virtually everything that has been said about carbon dioxide, CO2, is not true and the damage to our economy, education and national security has been substantial. Economic analysts estimate the entire cost of this misconception is over one trillion Dollars and growing by at least $30 billion per year. 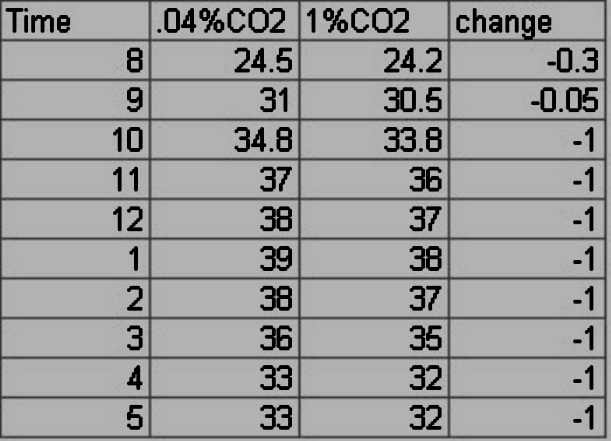 We published a demonstration experiment showing the real role of CO2 in the atmosphere at http://ScienceFrauds.blogspot.com entitled “CO2 Is Innocent” and another, “Proving Climate Change” which included this chart: The “0.04% CO2 is the atmosphere of today and “1% CO2” is the atmosphere the American Meteorological Society required for 90 years for a gas to be considered physically in the atmosphere, but now that they get $2 million funding from the EPA they no longer ignore CO2, but as you can see CO2 does not heat the atmosphere with even 25 times more than present, but it cools it! The way the atmosphere really works is no longer taught to physical science students. Turn the page…. We are a member of the “LinkedIn” Internet service linking professionals in many fields. We submitted our credentials and were linked with hundreds of physical scientists. We sent every one a copy of our paper describing the demo experiment that produced this graph. To date we have received one “smiley face” logogram with a curious, non-committal note, three nasty notes questioning our sanity, credentials and manhood. All the rest have ignored us. 90% of these people are in government posts regarding “Climate Change” and all the rest are in corporations with likely government contracts. We understand these are men and women with student loans to be repaid, spouses to be supported, children, mortgages, and pets; the whole disaster, and they are trapped, but many believe in a way that should never happen in a free country. Or obversely, documenting that America is not free, not able to see truth or not even wanting truth. In any case the damage is total and while the trucks are rolling, the store shelves are full it all may be an illusion like “Climate Change” and the fact that only Dilbert exposes a great fraud. 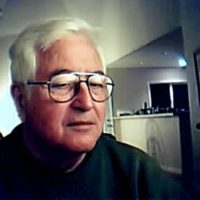 Adrian Vance is a writer and producer of educational films, filmstrips and audio programs with over 325 productions from script to screen. See a partial list of his credits at http://worldcat.org. He has written for ten national magazines, been on the masthead of two as an Editor, written 20 books. He is an FCC licensed broadcaster with ten years of on-air experience in talk radio and television. He is a frequent participant on CRN Talk Radio. He is an inventor and US Patent holder. His blog, "The Two Minute Conservative" is at http://adrianvance.blogspot.com It includes over 4500 daily pieces.